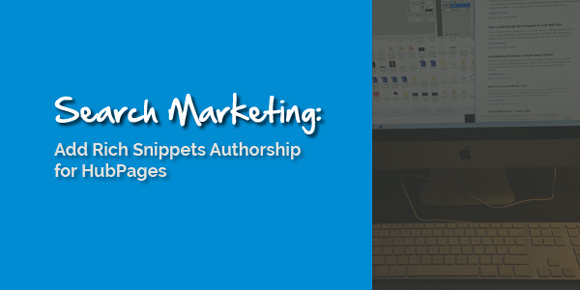 Following up on how to get your picture next to your SERP listings, I thought I would show you that you can also get Rich Snippet goodness for authoring articles on OTHER sites as well. Today’s example is going to be HubPages. I am not going to get into “what HubPages is” other than to say, it is a site where authors can publish articles. They have a lot of authority in the search engines as HubPages has a lot of content to offer users. So, if you are an aspiring author or publisher, it is a great resource to help build your own authority. In the text box you are presented with, you will want to modify your bio so that you have a link pointing to your Google+ profile. The link will have to have ?rel=author appended to the end. I would recommend the anchor text (the text of the link you will create) be your name with a “+” on the end (no space). Ok, so save all of that business and let’s move on to the next step. The other part that makes all of this work is “claiming” your profile on Google+ by adding a link to your hubpages profile FROM Google+. So, as we did in my Rich Snippets tutorial, we are going to add a contributor link. Rather than rewriting it all here, please just see my original Rich Snippets tutorial if you are not sure how to add a Contributor link to your Google+ profile. It is really pretty simple. If you run into problems let me know in the comments below and I will see if we can’t get it working.